We’ve all seen what happened in Rome last Saturday. What was meant to be a peaceful demonstration, displaying empathy to the Occupy Wall Street movement in the US, turned into destruction of the city and violent clashes between the police and the protesters. Those responsible for it, surprise surprise, are still them: the Black-Bloc. A quick Wikipedia search reveals that ‘Black Bloc’(BB) is not a group, an organized anarchist faction, etc., but is “a strategy”. Which in itself says something very interesting: being a BB means to wear black clothes, and a black helmet. It is easy to be a BB. In Italy, BB have a particularly strange vampire-like behaviour: they sleep for most of the time, and then suddenly wake up at anti-government protests. We saw this in Rome last week as well. Suddenly, out of the blue (of the black? ), the BB appeared and brought havoc into the protest: the police, eventually, broke in, the protesters (all of them) were dispersed. Outraged condemnations, from politicians, of the violence immediately followed everywhere on the media. Even those usually wary of joining the current government, have supinely endorsed the anarchist-plot argument. Sadly, also IlFattoQuotidiano, probably the only readable newspaper in Italy, has decided to stop asking questions, and to serve the master instead. 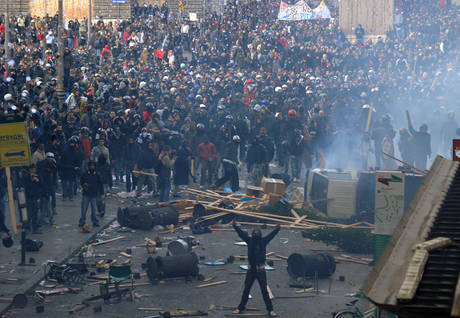 In the last 24 hours, the frustrated reader has had to go through a series of embarassing fairy tales about anarchists who ‘trained in Greece’, ‘trained at NO TAV protests’: a further depressing symptom of how bad information in Italy is. I should stop now with this, but i is worth repeating it, those of IlFatto have turned into mercenari too. Anyway, apparently two hundred thousand people took part in the protest.The BB were between 300 and 500. Of them, TWELVE have been arrested by the police. That is 12 individuals, nothing more than that. Twelve is a pretty small number. It’s basically a football team, plus the referee. Not a great reaction from the police, really – some have pointed out. Why did the police not intervene more heavy-handedly? Why did this thing happen only in Italy? why were the other OWS protests around the world kept under control by the police? why such a failure, given that the police now claims the destruction was caused by ‘the usual suspects’, anarchists already well known?. These questions briefly appeared on some Italian media shortly after the riots, yet they were quickly replaced by stuff like that appeared on IlFattoQuotidiano. So the question now is: why no one asks these questions anymore? Here is one hint. Please read. Here’s another hint. Please watch. 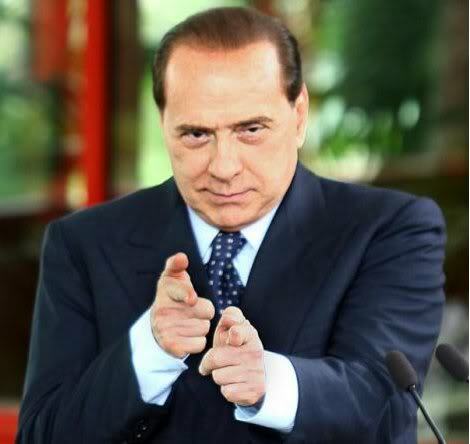 The Italian government today declared its intention to crack down on ‘the anarchists’ (even if they are not black). It is expected that the lord-major of Rome will today declare a one-month ban on street protest in the capital. This, let’s make itclear, in the interest of security, and of no one else.